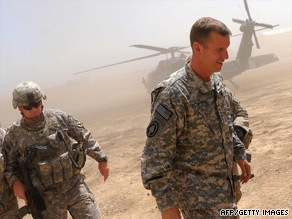 WASHINGTON (CNN) -- America's top commander in Afghanistan warns that more troops are needed there within the next year or the nearly 8-year-old war "will likely result in failure," according to a copy of a 66-page document obtained by The Washington Post. McChrystal "really takes his finger and puts it in their eye, 'Deliver or this won't work,'" Woodward told CNN's "American Morning" on Monday. "He says if they don't endorse this full counterinsurgency strategy, don't even give me the troops because it won't work." The document was "leaked" to the newspaper, but parts were omitted after consultations between the newspaper and the Department of Defense, Pentagon spokesman Geoff Morrell said. "While we would have much preferred none of this be made public at this time, we appreciate the paper's willingness to edit out those passages, which would likely have endangered personnel and operations in Afghanistan," Morrell said in a statement. President Obama is considering the assessment of troop levels completed by McChrystal over the summer, however, a review of U.S. strategy in Afghanistan won't be driven "by the politics of the moment," Obama said on Sunday. "Every time I sign an order, you know, I'm answerable to the parents of those young men and women who I'm sending over there, and I want to make sure that it's for the right reason," Obama told CNN's "State of the Union." The president put off questions about whether additional troops would be needed, saying, "I don't want to put the resource question before the strategy question." But he said Afghans need to show that they are "willing to make the commitment to build their capacity to secure their own country." TIME.com: The Afghanistan Problem: Why Are We in Helmand? The United States now has about 62,000 U.S. troops in Afghanistan, with NATO and other allies contributing about 35,000 more. The Pentagon is planning to add 6,000 troops by year's end, and some members of Congress say McChrystal soon will call for thousands more. "To the extent that our strategy in Afghanistan is serving that goal, then we're on the right track," he said. "If it starts drifting away from that goal, then we may have a problem." CNN Chief International Correspondent Christiane Amanpour's new live global interview program. "If we can get the Afghan army much larger, much better equipped, and if we can also get a plan, finally, for co-opting or reintegrating those lower-level Taliban people the way we did in Iraq -- if we can get that in motion -- that hopefully will have an effect on how many additional troops we need to go to Afghanistan," Levin told CNN on Sunday. "We would like to see Gen. McChrystal and Gen. Petraeus come up to Congress, like they did during the Iraq surge and give us the information about what they're recommending," McConnell said. "We think the time for decision is now." But he added that if more troops were needed, "I think the president will enjoy a lot of support among Senate Republicans." "I've been told Gen. McChrystal's ready to hit the send button in terms of how many more troops he needs, and the longer we wait the harder it is," said Graham, of South Carolina. Levin said hearings would be held "when we have a recommendation that is made to the president, and when the president makes his decision."